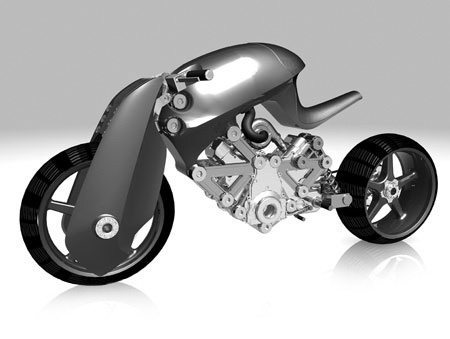 Conceived by the leader of our conceptual design team, Mr. Ed Jacobs, the motorcycle is at once primitive, bohemian, and yet highly technical. She is skeletal, i.e. she showcases human crafts work. The machine is minimal ; using the fewest pieces, moving parts and systems to accomplish her dynamic mission. She is uncompromised, light weight, possesses enormous torque, is capable of extreme performance, yet has maximum real world streetable active safety. She is graceful in motion, yet potentially brutal. She exudes inner beauty through absolute follow through of truth of concept. She has great proportions, holistic brand gestalt, is original, impactful, alluring and elegant. The Driving concept was the creation of a conceptually flexible foundation to allow a place for growth and further iteration. A utilitarian modular flexible foundation.